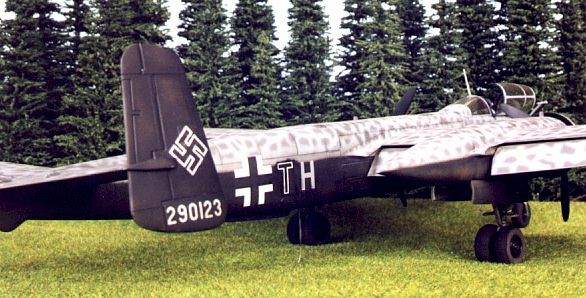 This short Reference Feature illustrates the main camouflage schemes found on Germany's best production night-fighter, the Heinkel He 219. 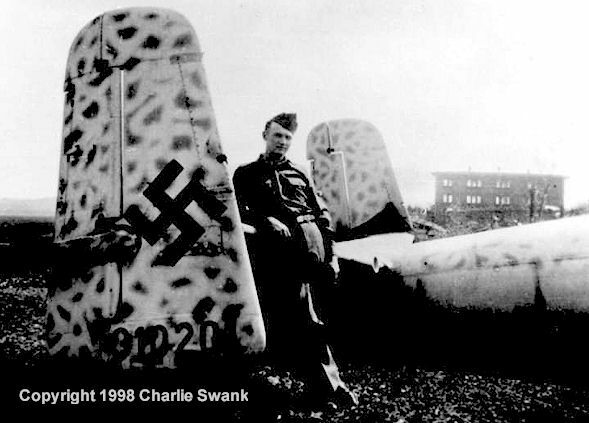 Charlie Swank provides the original wartime photographs, and five more images of Chris Wauchop's He 219 in 1/48 scale may be found at the bottom of the page. Thanks also to Stephen M. Fochuk for his comments and corrections. Part One of this series focuses on the Dornier Do 217. The British night-bombing campaign over Germany was in full swing by mid-1943. Germany's air defences used radar-based technology to counter this threat from the summer of 1941. These early tactics involved ground-based radar guiding a fighter into a zone where it could then engage the enemy aircraft. Swift improvements in technology soon allowed more sophisticated radar to be installed in night-fighter aircraft, permitting more independent operations. However, the size, weight and additional workload imposed by the radar meant that the aircraft needed to be fairly large and manned by at least two crew - a pilot and a radar operator. Consequently, the aircraft used as night-fighters tended to be bomber or zerstörer types, adapted to the role out of expediency. Although the Ju 88 was quite well suited to the role, other types were barely capable of keeping up with the bomber stream. Heinkel commenced work on a purpose-built night fighter as early as January 1942. The Heinkel 219V1 flew for the first time on 15 November, 1942. The road to production was plagued with supply problems and interference by the RLM. By the end of 1944 only 320 He 219s had been delivered to Luftwaffe units. Nevertheless, the aircraft was by far the best production night-fighter the Luftwaffe could field. Even equipped with its massive offensive firepower of four 30mm MK 108 cannon, two 30mm MK 103 cannon and two 20mm MG 151 cannon, it could still attain a top speed of 416mph. Its flight characteristics were forgiving, and it proved to be easy to maintain under operational conditions. I/NJG 1 was the only gruppe to be equipped with the He 219, although a small number of aircraft were attached to other units on the western front, including NJG 3..
Heinkel He 219A-5, Werknummer 190176 at Grove, Denmark in May 1945. This aircraft was probably attached to 3./NJG 3. This Uhu is finished in overall RLM 76 White-Blue, with an irregular and untidy "squiggle" of RLM 75 Grey-Violet. The werknummer and a code indicating the radar type were sometimes seen painted under the canopy, as is the werknummer in this picture. Spinners were sometimes left painted in RLM 70 Black-Green as in this example, or were often overpainted in RLM 76. Few examples were seen with spinner spirals. This marvelous photograph illustrates the second style of camouflage. In the early part of the war, many night fighters wore black lower-surfaces, but this was less common by 1944. However, at least some He 219s received a very tidy, factory-finished coat of black on the lower surfaces and vertical tail surfaces. Note the crisp werknummer, Hakenkreuz and Balkenkreuz. The second characteristic of this camouflage was the application of the upper-surface colours. The upper surface appears to have first received a solid coat of RLM 75 Grey-Violet, with a very tight, uniform "squiggle" of RLM 76 White-Blue. This creates the impression of a Grey-Violet mottle. This method of application was also seen on many Bf 110G night fighters. Geschwader code D5 and the partial code letter are most likely painted in RLM 77 light grey, although it is possible that another colour was used. Werknummer 310201 illustrates the 76 over 75 scheme very clearly. The base coat on the upper surfaces and vertical tail is certainly the darker RLM 75 Grey Violet. 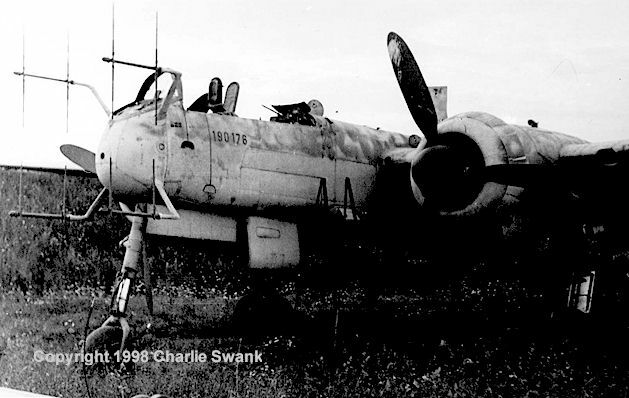 The wrecked He 219 at the right of this photograph displays a field-applied scheme seen on a variety of night-fighter types toward the end of the war. As German fuel supplies dwindled and Allied ground-attack aircraft dominated the European skies, it became crucial for the Luftwaffe to disguise their aircraft on the ground. This Uhu has apparently received a heavy overspray of either RLM 81 Brown-Violet or RLM 83 Dark Green (or possibly both). It is difficult to determine whether the lower surfaces are black, or if the contrast is simply shadow. The demarcation line looks a little low for a standard black-bottomed Uhu. The code appears to be overpainted in a very pale colour, perhaps RLM 76. This unusual aircraft also seems to wear a narrow black spiral on a white spinner. It is interesting to see the high-tech Uhu operating alongside a decidedly low-tech Stuka at the very end of the war. Tamiya's 1/48 scale He 219 is typical of their most recent releases - crisp detail, flawless moulding, simple construction and clever engineering. 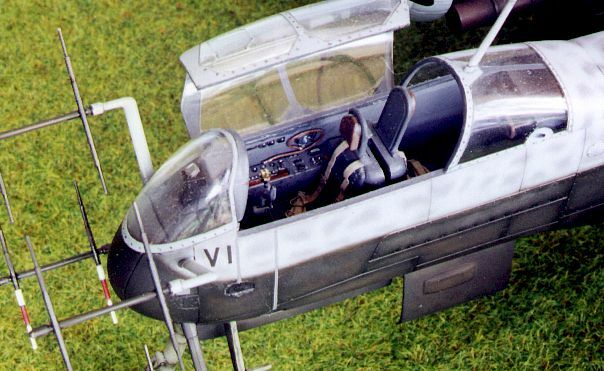 The kit comprises approximately 124 grey plastic parts, 8 clear parts, 2 poly caps, 1 white metal cockpit tub and markings for three aircraft. The mottled paint finish applied to the "Uhu" is a critical factor to the authenticity of this model. Who better to apply such a finish than the "zen master of 1/48 scale" - Chris Wauchop? Chris has used Gunze paints to achieve this beautiful finish. His application of the camouflage duplicates the full-sized method. Chris painted the upper surfaces RLM 75 Grey-Violet, then applied a tight squiggle of 76 White-Blue to create the mottle effect. Click the thumbnails below to view the image full-sized. To return to this page, click the "Back" arrow on your browser.